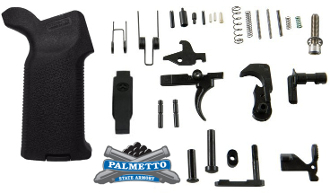 Palmetto State Armory Complete AR15 MOE K2 Lower Parts Kit for you lower receiver. A high quality lower parts kit needed to assemble your AR-15 lower. Parts are 100% made in USA! The LPK-MOE-K2 replaces the standard A2 Pistol Grip and the standard trigger guard with Magpul MOE K2 grip and MOE trigger guard. Gen 2 Kit!! Features a black oxide coated bolt catch roll pin, and black oxide coated hammer and trigger springs. The MOE-K2 is a drop in upgrade for AR15/M4 pistol grips with a more vertical grip angle optimized for short LOP weapons, such as PDW (Personal Defense Weapon) configurations. Unlike other grips with more vertical angles that tilt the grip at the expense of optimum trigger finger alignment, the K2 is shaped to keep the trigger finger properly aligned with the trigger. It features our new aggressive TSP texture for positive weapon control and is compatible with Magpul Grip Cores for storage customization.